CTLA-4-mediated inhibition of T cell activation may be accomplished by competition for ligands and/or by signals mediated through the intracellular domain. Studies have implicated Tyr201 in the cytoplasmic domain of CTLA-4 in regulating CTLA-4 signal transduction and intracellular trafficking. To investigate the mechanism of CTLA-4 function in vivo, transgenes encoding wild-type CTLA-4 (FL), a mutant lacking the cytoplasmic domain of CTLA-4 (ΔCTLA-4 tail), or a CTLA-4 Tyr201 mutant (Y201V) were introduced into CTLA-4-deficient mice. CTLA-4−/− mice display an autoimmune lymphoproliferative disorder resulting in tissue destruction and early death. When either the FL or the Y201V transgene was bred into CTLA-4−/− animals, a complete rescue from lymphoproliferation and autoimmunity was observed. In contrast, CTLA-4−/− mice expressing the ΔCTLA-4 tail transgene were long lived with no evidence of multiorgan lymphocytic infiltration, but exhibited lymphadenopathy and accumulated large numbers of activated T cells. Furthermore, these animals displayed a Th2-biased phenotype which conferred susceptibility to Leishmania infection. These results indicate that the inhibitory effect of CTLA-4 is mediated in part through the ability of the extracellular domain to compete for ligands. The cytoplasmic domain of CTLA-4, however, is required for complete inhibitory function of the receptor and for regulation of Th cell differentiation in vivo. CTLA-4 (CD152) and CD28 are structurally related T cell surface molecules that possess opposing activities. Whereas CD28 is a major co-stimulatory receptor, CTLA-4 is involved in the down-regulation of the immune response (1, 2, 3). The critical role of CTLA-4 in negatively regulating T cell responses has been demonstrated in a variety of in vivo systems. Blocking Abs to CTLA-4 have been shown to augment the immune response, resulting in enhanced clearance of tumors and parasites (4, 5, 6, 7, 8, 9, 10, 11), exacerbated autoimmune disease (12, 13, 14), and enhanced allograft rejection and graft-versus-host disease (15, 16). Studies have also implicated a role for CTLA-4 in the induction of tolerance (17, 18). The most dramatic demonstration of the involvement of CTLA-4 in the negative regulation of the immune response is provided by the study of CTLA-4-deficient mice. These animals display a massive lymphoproliferative disorder accompanied by extensive lymphocytic infiltration into multiple organs, resulting in tissue destruction and death of the animals at 3–4 wk of age (19, 20, 21). CTLA-4-deficient mice display polyclonal T cell expansion with the majority of T cells exhibiting an activated phenotype. This disorder appears not to be due to a defect in thymic selection but is mediated primarily by uncontrolled activation of peripheral CD4+ cells (21, 22, 23). Activation of CTLA-4−/− T cells is dependent on CD28 stimulation as either blocking the CD28 ligands B7-1 (CD80) and B7-2 (CD86) or rendering mice deficient for B7-1 and B7-2 rescues the CTLA-4−/− phenotype (24, 25). Lymphoproliferation of T cells has been shown not to be cell autonomous since RAG−/− mice reconstituted with a mixture of normal and CTLA-4−/− bone marrow do not develop the CTLA-4−/− phenotype, demonstrating that the presence of wild-type cells can prevent the defect (26). How CTLA-4-mediated inhibition is accomplished has not been well defined. One proposed mechanism is through competition for ligand by the extracellular domain of CTLA-4. CTLA-4 binds the same ligands as CD28 but has been found to bind with higher affinity (27, 28, 29). CTLA-4 may function by sequestering surface B7 ligands, thus preventing CD28 signaling. The cytoplasmic domain of CTLA-4, however, has been found to be 100% conserved between species, suggesting that this domain is important for CTLA-4 function. Several studies have suggested that CTLA-4 may possess signaling capabilities that antagonize signal transduction delivered through either CD28 and/or the TCR (30, 31, 32). Alternatively, CTLA-4 may function by sequestering cytoplasmic signaling molecules via its cytoplasmic domain. These mechanisms are not mutually exclusive and a combination may be employed to exert the inhibitory effect of CTLA-4. CTLA-4 has a short 36-aa cytoplasmic tail that contains two tyrosine-based motifs. The YVKM motif at Tyr201 (Y201) has been shown to regulate the association of CTLA-4 with cytoplasmic signaling molecules as well as with proteins that control intracellular trafficking. The phosphorylated form of YVKM is reported to associate with phosphatidylinositol 3-kinase (30) and the Src homology 2 containing tyrosine phosphatase-2 (32, 33). Recent studies also provide evidence for the association between CTLA-4 and the CD3-ζ chain of the TCR and suggest that CTLA-4 may interfere with early TCR signaling events (32). The cell surface expression and intracellular trafficking of CTLA-4 is highly regulated (34, 35, 36). CTLA-4 is undetectable on the surface of naive T cells and is induced upon activation. Even upon maximal induction, however, the majority of CTLA-4 is found inside the cell. This intracellular localization is due in part to the rapid internalization of cell surface CTLA-4. The Y201 YVKM motif forms a consensus tyrosine-based sorting motif that mediates the interaction with the clathrin-associated adapter complex AP-2, which regulates endocytosis at the plasma membrane. This same YVKM motif has also been found to associate with the clathrin adapter complex AP-1, which appears to shuttle excess CTLA-4 from the Golgi to lysosomal compartments for degradation (37). Mutation of Tyr201 inhibits internalization and results in increased levels of CTLA-4 on the cell surface (38). Whereas the association of CTLA-4 with phosphatidylinositol 3-kinase and Src homology 2 containing tyrosine phosphatase 2 has been reported to depend upon tyrosine phosphorylation of CTLA-4 Y201 (30, 33), phosphorylation of this tyrosine abrogates AP-2 binding (39, 40, 41). Y201, therefore, has the potential to regulate both trafficking and signal transduction of CTLA-4 by binding in the unphosphorylated state to clathrin-associated complexes and upon phosphorylation providing a docking site for the recruitment of cytoplasmic signaling molecules (1). To address the question of how CTLA-4-mediated inhibition is achieved in vivo, we produced mice expressing either the full-length CTLA-4 receptor (FL), a receptor consisting of the CTLA-4 extracellular and transmembrane domains without the cytoplasmic domain (ΔCTLA-4 tail), or a mutant form of CTLA-4 in which Y201 had been replaced by valine (Y201V). These animals were then bred to homozygosity for a null mutation at the endogenous ctla-4 locus to assess the capability of the transgene-encoded proteins to rescue the CTLA-4-deficient phenotype. Complementation with either the FL transgene or the Y201V transgene appeared to provide for a complete rescue of the CTLA-4-deficient phenotype. Mice expressing the ΔCTLA-4 tail transgene retained the lymphadenopathy defect and accumulated large numbers of activated T cells with age, but showed no evidence of multiorgan lymphocytic infiltration and had a normal life span. Furthermore, these mice displayed a Th2-biased phenotype. 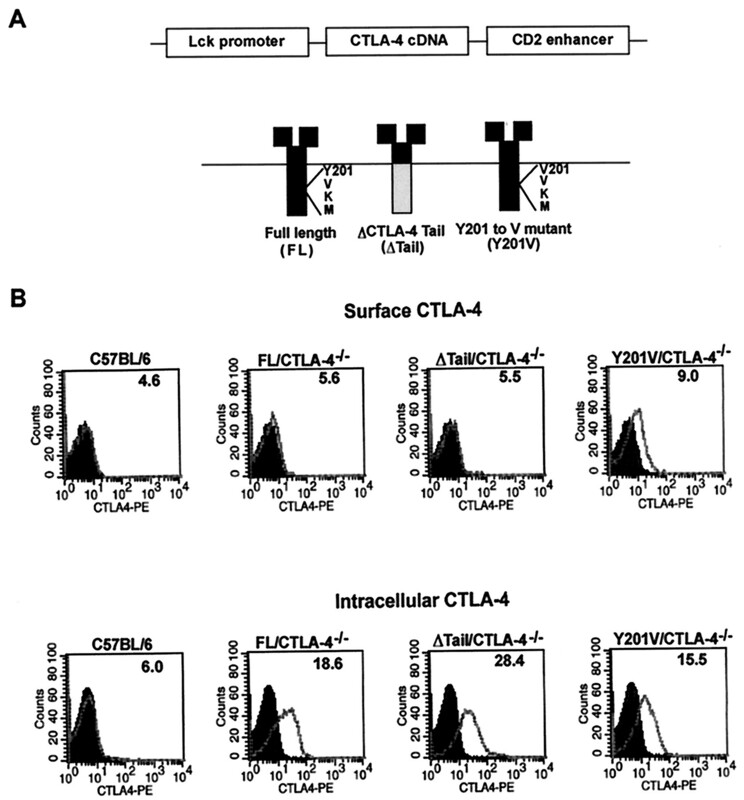 These results indicate that a partial contribution of CTLA-4 in regulating the immune response occurs in the absence of the cytoplasmic domain of CTLA-4, suggesting that the inhibitory effect of CTLA-4 is mediated in part through the ability of the extracellular domain to compete for ligands. The cytoplasmic domain of CTLA-4, however, is required for complete inhibitory function of the receptor. These data also provide novel in vivo evidence of the critical role of CTLA-4 in regulating Th cell differentiation. Transgenic constructs were made by ligating the HindIII/XbaI fragment of pcDNA3 CTLA-4 or pcDNA3 CTLA-4 Y201V (38) or the HindIII/XhoI fragment of pcDNA3 CTLA-4 Δtail (42) into the AscI site of the vector pLckE.2. The pLckE.2 vector was provided by Drs. T. Hettmann and J. Leiden (Harvard Medical School) and contains the proximal Lck promoter (43) and the CD2 enhancer (44). CTLA-4 sequences and mutations were confirmed by DNA sequencing. A downstream in-frame stop codon contained within the transgene vector was utilized in the pLckE.2 CTLA-4 Δtail construct, resulting in the replacement of the CTLA-4 residues 191–223 with the amino acids STRQDPKAQLPEPLRVLWTAHLAAMATGKRP. Transgene DNA was microinjected into the male pronucleus of fertilized single-cell embryos of CD1 mice. Microinjected eggs were transferred to pseudopregnant CD1 foster mothers. Transgene integration was determined by Southern blot analysis and by PCR using standard techniques. Expression of CTLA-4 protein on T cells was analyzed by flow cytometry using PE-conjugated anti-CTLA-4 Ab (PharMingen, San Diego, CA). The absence of the CTLA-4 cytoplasmic domain in the ΔCTLA-4 tail strain was confirmed by the lack of detectable CTLA-4 protein on Western blot analysis using the polyclonal Ab C-19 that recognizes the CTLA-4 carboxyl terminus (Santa Cruz Biotechnology, Santa Cruz, CA). Western blotting using a polyclonal Ab that recognizes the CTLA-4 extracellular domain (Q20; Santa Cruz Biotechnology) detected the presence of CTLA-4 protein that migrated with an apparent molecular mass of 45 kDa. Transgenic mice (Tg+CTLA4+/+) were bred to Rag−/−CTLA-4−/− mice (129 × C57BL/6), a generous gift from Dr. M. Alegre (University of Chicago), and resulting Tg+Rag−/+ mice were bred to CTLA-4+/− mice that had been crossed at least six times to the C57BL/6 strain to generate Tg+CTLA-4−/− mice. Tg+CTLA-4−/− were bred onto the C57BL/6 background for two to six generations. For histological studies, tissues were fixed in 10% Formalin and embedded in paraffin. Sections were stained with hematoxylin and eosin using standard techniques. Spleens were harvested and single-cell suspensions depleted of erythrocytes were prepared as described previously (36). Cells were grown in the presence of soluble 145-2C11 (0.1 μg/ml) and PV-1 (1 μg/ml) for the indicated times. Cell surface and intracellular CTLA-4 expression were detected by flow cytometry as described previously (42). To assess the activation status of T cells, spleen and lymph node cells were stained with FITC-conjugated anti-CD8 and Cy-Chrome (CyC)5-conjugated anti-CD4 and a panel of PE-conjugated Abs including anti-CD25, anti-CD69, anti-CD44, anti-CD45RB, and anti-CD62L. To assess the activation status of B cells, spleen and lymph node cells were double-stained with CyC-conjugated anti-B220 and PE-conjugated anti-B7-1, anti-B7-2, or anti-class II IAb. All Abs were purchased from PharMingen (San Diego, CA). Stained cells were analyzed on a FACSort or a FACSCalibur (Becton Dickinson, Mountain View, CA). Serum was collected from unimmunized 4-wk-old mice and analyzed by ELISA using commercial mAb pairs (PharMingen) according to the manufacturer’s instructions. Mice were immunized in the hind footpads with 5 μg KLH (Calbiochem, San Diego, CA) precipitated in alum. Nine days after immunizations, draining popliteal lymph nodes were harvested and single-cell suspensions were prepared in DMEM (supplemented with 10% FCS, 2 mM glutamine, 50 mM HEPES (pH 7.5), 100 U/ml penicillin, 100 μg/ml streptomycin, and 50 μM 2-ME). For ex vivo stimulations, 5 × 105 cells were cultured in either media alone or with the addition of KLH at 100 μg/ml. Supernatants were harvested at 48 h and analyzed for IL-4 and IFN-γ by ELISA using commercial mAb pairs (PharMingen) according to the manufacturer’s instructions. Infections were performed as described previously (45). In brief, wild-type or transgenic mice were injected in both hind footpads with 1 × 106 (for one experiment) or 5 × 105 (for second experiment) metacyclic promastigotes of Leishmania major (WHOM/IR/-/173). Lesion size was determined by measuring footpads with a metric caliper. After 5–8 wk, draining popliteal lymph nodes were collected and stimulated in vitro with soluble Leishmania Ag and analyzed for cytokine production as described previously (45). Parasite burden was determined as described previously (45). The response of mice of mixed CD1/C57BL/6 genetic background to infection with Leishmania is comparable to that of wild-type C57BL/6 mice (S. L. Reiner, unpublished observations). T cell inhibition that is induced by CTLA-4 may be achieved through competition for CD28 ligands; in addition, the cytoplasmic domain of CTLA-4 may mediate CTLA-4 signal transduction. To determine the relative contributions of the different CTLA-4 domains to CTLA-4-inhibitory function in vivo, transgenic mice were generated that expressed either 1) full-length CTLA-4, 2) a CTLA-4 mutant in which the CTLA-4 cytoplasmic domain is replaced by random amino acids, or 3) a CTLA-4 mutant containing a valine substitution at Tyr201. The transgenes were expressed in mice under the regulation of the proximal Lck promoter and CD2 enhancer (Fig. 1⇓A), and integration of the transgene was assessed by Southern blot analysis (data not shown). 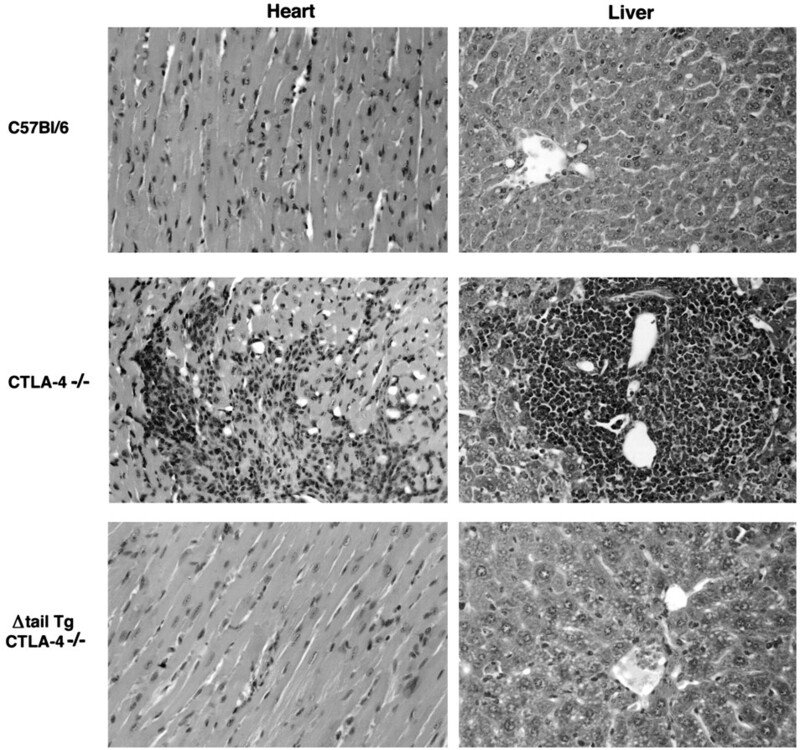 Constitutive expression of CTLA-4 transgenes was not observed to have gross physiological consequences in wild-type mice. Founders were then bred to homozygosity for the ctla-4 null mutation (19). Production of CTLA-4 transgenic mice. A, Schematic illustration of the CTLA-4 transgene. The full-length (FL) CTLA-4 receptor, a CTLA-4 mutant in which the cytoplasmic domain has been replaced by random amino acid sequences (ΔTail), or a CTLA-4 mutant in which valine has been substituted for Tyr201 (Y201V) were expressed as transgenes under the control of the Lck promoter and the CD2 enhancer. In this and subsequent figures, “ΔTail” refers to “ΔCTLA-4 to 1.” B, Surface and intracellular expression of CTLA-4 in T cells from transgenic mice. Lymph node cells from wild-type C57BL/6 or transgene+/CTLA-4−/− mice were stained with anti-CD3-CyC and anti-CTLA-4-PE and analyzed by flow cytometry. For intracellular staining, cells were permeabilized with saponin before staining. Shown are histograms of CTLA-4 expression on cells electronically gated on the CD3-positive population. CTLA-4 mean fluorescence is indicated in the upper right-hand corner. The filled histogram represents staining with PE-conjugated control hamster Ig. Surface and intracellular CTLA-4 expression of the transgene-encoded proteins was analyzed by flow cytometry. As shown in Fig. 1⇑B, CTLA-4 expression was not detected in CD3+ lymph node cells from wild-type C57BL/6 mice. In CTLA-4−/− mice expressing either the FL transgene or the ΔCTLA-4 tail transgene, low levels of CTLA-4 were detected on the cell surface of CD3+ lymph node cells, as indicated by a consistently higher mean fluorescence intensity compared with that obtained for cells from wild-type mice. In contrast, in mice expressing the Y201V mutant, higher levels of CTLA-4 were detected on the cell surface. Expression of all three transgenes was readily detected intracellularly (Fig. 1⇑B, bottom panels). The increased cell surface expression of the Y201V mutant is consistent with the role of Y201 in mediating CTLA-4 endocytosis. The ΔCTLA-4 tail mutant, which also lacks Y201, did not exhibit a similar increase in expression. This suggests that other residues within the CTLA-4 cytoplasmic domain are important for normal trafficking of CTLA-4 to the plasma membrane and/or its stable accumulation on the cell surface. In wild-type animals, CTLA-4 is not expressed on naive T cells but is induced upon T cell activation. To examine the effect of T cell stimulation on transgene-encoded CTLA-4 surface expression, splenocytes were stimulated with soluble anti-CD3 plus anti-CD28 and examined by flow cytometry for CTLA-4 expression on both CD4+ and CD8+ T cell subsets. CD4+ and CD8+ splenocytes from FL/CTLA-4−/− mice exhibited low but constitutive CTLA-4 surface expression that did not change with T cell activation (Fig. 2⇓A and data not shown). CD4+ and CD8+ splenocytes from ΔCTLA-4 tail/CTLA-4−/− and Y201V/CTLA-4−/− mice showed increased expression of surface CTLA-4 with stimulation, displaying similar kinetics compared with wild-type cells (Fig. 2⇓, B and C). Surface expression levels on cells isolated from ΔCTLA-4 tail/CTLA-4−/− mice reached similar levels as detected on wild-type cells (Fig. 2⇓B). Surface expression levels on cells isolated from Y201V/CTLA-4−/− mice reached 10 times higher geometric mean fluorescence intensity compared with wild-type cells (Fig. 2⇓C). Kinetics of cell surface and total cellular expression of transgene-encoded CTLA-4. 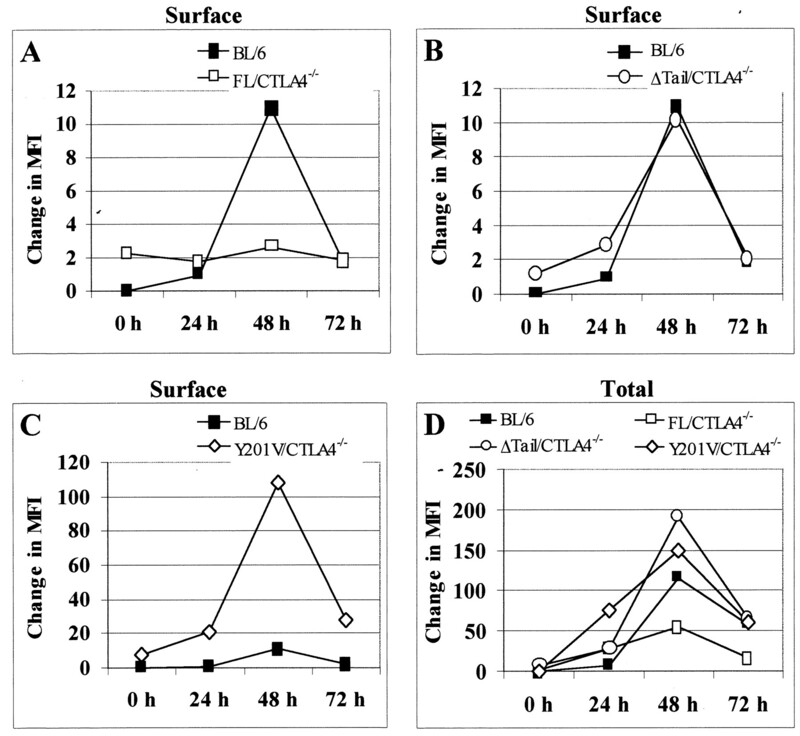 Spleen cells from wild-type, FL/CTLA-4−/−, ΔCTLA-4 tail/CTLA-4−/−, and Y201V/CTLA-4−/− mice were stimulated with soluble Abs to CD3 and CD28 as described in Materials and Methods. Cells were harvested at the indicated time points and surface stained for CD4 and CTLA-4 (A–C) or surface stained for CD4, fixed, permeabilized, and then stained for intracellular CTLA-4 (D). Results represent the geometric mean fluorescence of CD4+ cells obtained with the anti-CTLA-4 mAb minus that obtained with control hamster Ig and are representative of three independent experiments. 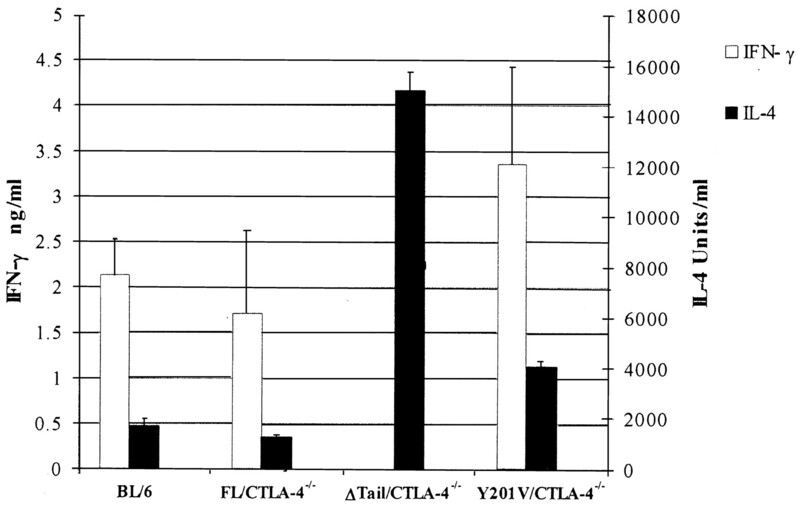 Surface CTLA-4 expression on FL/CTLA-4−/− (A), ΔCTLA-4 tail/CTLA-4−/− (B), and Y201V/CTLA-4−/− (C) cells compared with wild-type cells. 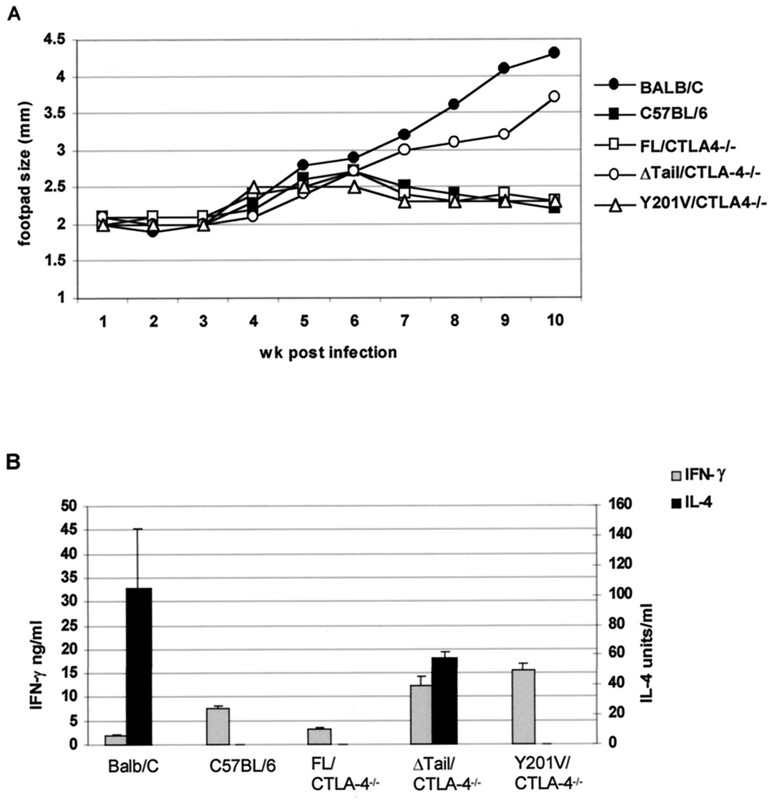 D, Total cellular expression of CTLA-4 on FL/CTLA-4−/−, ΔCTLA-4 tail/CTLA-4−/−, and Y201V/CTLA-4−/− cells compared with wild-type C57BL/6 cells. Total cellular expression of CTLA-4 on CD4+ cells from FL/CTLA-4−/−, ΔCTLA-4 tail/CTLA-4−/−, and Y201V/CTLA-4−/− mice showed similar kinetics of expression compared with wild-type cells (Fig. 2⇑D). Cells from ΔCTLA-4 tail/CTLA-4−/− and Y201V/CTLA-4−/− mice obtained higher levels and cells from FL/CTLA-4−/− mice obtained lower levels of peak expression compared with wild-type cells. Similar to what was seen in wild-type cells, expression of CTLA-4 on CD8+ cells, both surface and total, from each of the transgenic animals mirrored that detected on CD4+ cells but with slightly higher levels of expression (data not shown). CTLA-4 deficiency results in a lethal phenotype with death occurring at ∼3–4 wk of age. CTLA-4−/− animals bearing the FL transgene or the Y201V transgene were completely rescued from early lethality. FL/CTLA-4−/− and Y201V/CTLA-4−/− mice lived well into adulthood and reproduced normally. ΔCTLA-4 tail/CTLA-4−/− mice also lived into adulthood and reproduced normally. A second founder expressing lower levels of the ΔCTLA-4 tail transgene also showed prolonged survival, although most of these animals ultimately succumbed to lymphoproliferative disease. Thus, the ability of the ΔCTLA-4 tail transgene to rescue the lethality of the disease correlated with the level of the ΔCTLA-4 tail receptor detected on the surface of CD4+ T cells. Experiments shown are from animals derived from the founder that expressed higher levels of the ΔCTLA-4 tail transgene. In addition to early death, CTLA-4-deficient mice display splenomegaly and lymphadenopathy with the number of lymphocytes in the spleen and lymph nodes reaching 5- to 10-fold higher numbers compared with wild-type animals (19, 20). The presence of the FL or Y201V transgene corrected this defect (Fig. 3⇓). In contrast, lymph nodes (but not spleens) from ΔCTLA-4 tail/CTLA-4−/− animals showed increasing numbers of cells with age, achieving 10-fold higher numbers compared with age-matched wild-type controls. ΔCTLA-4 tail/CTLA-4−/− mice accumulated increased numbers of lymph node cells with age. Lymph nodes were isolated from wild-type, CTLA-4−/−, FL/CTLA-4−/−, ΔCTLA-4 tail/CTLA-4−/−, and Y201V/CTLA-4−/− mice at the indicated time points and cell number per animal was determined. To examine whether these animals, like CTLA-4-deficient mice, also accumulated activated T cells, lymph node and spleen cells were stained for CD4 and CD8 and various T cell activation markers. Young FL/CTLA-4−/−, ΔCTLA-4 tail/CTLA-4−/−, and Y201V/CTLA-4−/− mice maintained a naive T cell phenotype and displayed normal percentages of CD4+, CD8+, and B220+ cells (data not shown). At 2 mo of age, FL/CTLA-4−/− and Y201V/CTLA-4−/− mice still maintained a naive phenotype, as increased expression of the activation markers CD25 and CD69 was not detected in T cells from these mice. In contrast, 2-mo-old ΔCTLA-4 tail/CTLA-4−/− mice displayed an increase in both the percentage and absolute numbers of CD4+ lymph node cells expressing increased levels of the activation markers CD25, CD69, or CD44 and decreased levels of CD45RB and CD62L (Fig. 4⇓ and data not shown). The percentage of CD8+ lymph node cells from 2-mo-old ΔCTLA-4 tail/CTLA-4−/− mice displaying activation markers was also increased (data not shown). Two-month-old ΔCTLA-4 tail/CTLA-4−/− mice showed increased percentages of activated CD4+ T cells. Lymph node cells from 2-mo-old wild-type, FL/CTLA-4−/−, ΔCTLA-4 tail/CTLA-4−/−, and Y201V/CTLA-4−/− mice were double stained for CD4 and either the activation marker CD25 or CD69. For comparison, expression of activation markers on CD4+ lymph node cells from a 4-wk-old CTLA-4−/− mouse is also shown. The percentage given is the percentage of CD4+ cells staining positively for the indicated marker. Despite the presence of large numbers of activated T cells in 2-mo-old ΔCTLA-4 tail/CTLA-4−/− mice, there was no evidence of mononuclear infiltrates in any of the organs analyzed (Fig. 5⇓). FL/CTLA-4−/− and Y201V/CTLA-4−/− mice also showed no evidence of lymphocytic infiltration into any of the organs analyzed (data not shown). Histological sections of heart and liver from 4-wk-old wild-type (C57BL/6) mice, 4-wk-old CTLA-4−/− mice, or 2-mo-old ΔCTLA-4 tail/CTLA-4−/− mice. Sections were stained with hematoxylin and eosin and visualized by light microscopy using a ×40 oil immersion objective. In addition to accumulation of activated T cells, ΔCTLA-4 tail/CTLA-4−/− mice also showed in vivo activation of B cells as determined by the up-regulation of MHC class II and B7-2 molecules (data not shown). 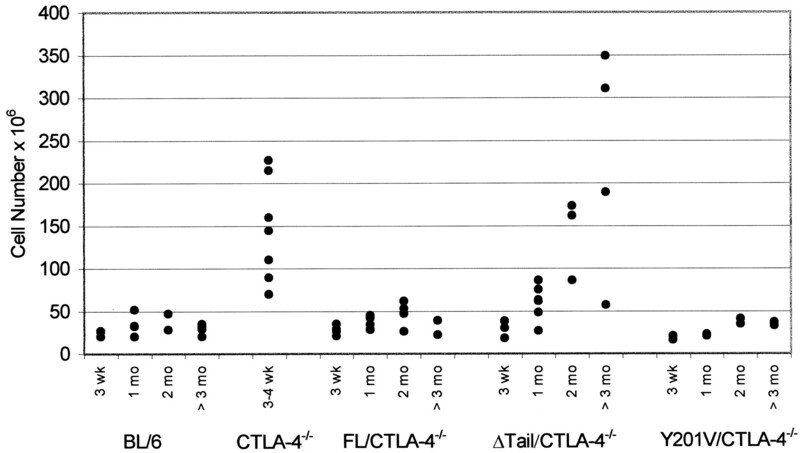 FL/CTLA-4−/− and Y201V/CTLA-4−/− mice exhibited normal percentages of activated B cells. To quantitate basal Ig isotype levels, we analyzed sera from unimmunized wild-type mice, CTLA-4−/− mice, and the three different Tg+/CTLA-4−/− lines by ELISA. 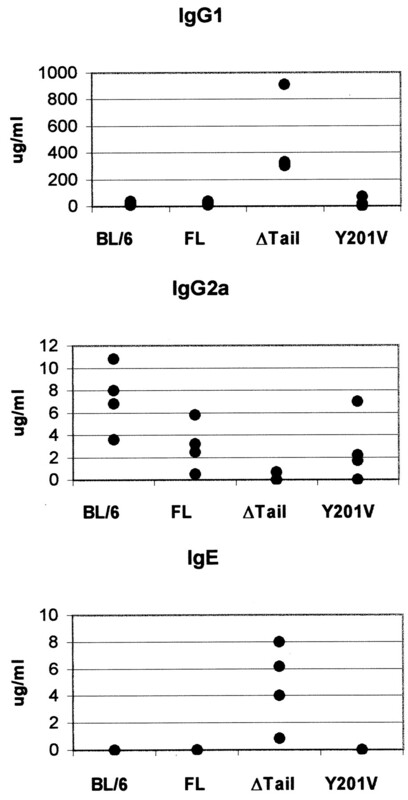 Compared with wild-type mice, CTLA-4−/− animals showed increased levels of IgG1, IgG2a, and IgE (data not shown and Ref. 19), whereas there was no difference in the levels of these Igs between wild-type and FL/CTLA-4−/− or Y201V/CTLA-4−/− mice (Fig. 6⇓). In contrast, ΔCTLA-4 tail/CTLA-4−/− mice had significantly higher levels of only the IL-4-dependent Igs IgG1 and IgE and had lower levels of the IFN-γ-dependent Ig IgG2a compared with wild-type mice (Fig. 6⇓), indicative of a Th2-biased phenotype. ΔCTLA-4 tail/CTLA-4−/− mice displayed a Th2 phenotype. Sera obtained from 4-wk-old unimmunized wild-type, FL/CTLA-4−/−, ΔCTLA-4 tail/CTLA-4−/−, and Y201V/CTLA-4−/− mice were analyzed by ELISA for IgG1, IgG2a, and IgE. Four individual animals were analyzed for each group. To determine whether the Th2 skewing observed in ΔCTLA-4 tail/CTLA-4−/− mice reflected a feature of an in vivo Ag-specific immune response, we immunized mice with KLH precipitated in alum. Nine days later, draining lymph node cells were restimulated with KLH in vitro and the cytokine profile was determined (Fig. 7⇓). Cultures from FL/CTLA-4−/− mice produced relatively equivalent levels of IL-4 and IFN-γ compared with cultures from wild-type mice. Cultures from Y201V/CTLA-4−/− mice were variable, sometimes displaying similar levels of IL-4 and IFN-γ compared with wild-type cultures and sometimes showing higher levels of both IL-4 and IFN-γ. In contrast, cultures from ΔCTLA-4 tail/CTLA-4−/− mice consistently produced greatly elevated levels of IL-4 compared with wild-type cultures and low to undetectable levels of IFN-γ, indicative of an enhanced Th2 response. The differences in cytokine production were not due to differences in proliferative capacity because lymph node cells isolated from transgenic and wild-type mice rechallenged with graded doses of KLH or a control Ag demonstrated similar proliferative responses (data not shown). Lymph node cells from ΔCTLA-4 tail/CTLA-4−/− mice produce an enhanced Th2 response upon stimulation with KLH. Wild-type, FL/CTLA-4−/−, ΔCTLA-4 tail/CTLA-4−/−, and Y201V/CTLA-4−/− mice were immunized with KLH precipitated in alum. Nine days later, draining lymph node cells were stimulated with KLH for 2 days and supernatants were analyzed for levels of IFN-γ (□) and IL-4 (▪) by ELISA. The results shown are the mean of triplicate wells from individual mice and are representative of five mice from three independent experiments. Th cells from ΔCTLA-4 tail/CTLA-4−/− mice appear to skew toward a Th2 pathway as evidenced in elevated production of the Th2 cytokine IL-4 by effector cells ex vivo and increased production of the IL-4-dependent Igs IgG1 and IgE. To determine whether this bias in differentiation resulted in physiological consequences in vivo, mice were injected in the hind footpads with the intracellular pathogen L. major. Control of this disease is dependent on the successful development of Th1 cells and their production of IFN-γ, which is required to activate macrophage-mediated clearance of the parasite (46). Strains that are genetically predisposed to produce a Th1 response, such as the C57BL/6 and CD1 strains, are able to control the disease. IL-4 production by Th2 cells negatively regulates macrophage-activated clearing and, therefore, strains such as BALB/c that are genetically predisposed to develop a Th2 response are susceptible to the disease. The course of infection was monitored by measuring the size of the local lesions (Fig. 8⇓A). Wild-type C57BL/6 mice were capable of controlling the infection, with the initial slight swelling of the injected footpads being followed by resolution of the lesions. BALB/c mice were unable to control the infection and developed progressive enlargement of their footpads. FL/CTLA-4−/− and Y201V/CTLA-4−/− mice were capable of controlling the infection, showing resolution of their lesions. In contrast, ΔCTLA-4 tail/CTLA-4−/− mice were unable to control the infection and demonstrated progressive enlargement of their footpad lesions. Parasite cultures from the feet and spleens of the infected mice confirmed that FL/CTLA-4−/− and Y201V/CTLA-4−/− mice had resolved the infection, whereas ΔCTLA-4 tail/CTLA-4−/− mice had not (data not shown). ΔCTLA-4 tail/CTLA-4−/− mice are susceptible whereas FL/CTLA-4−/− and Y201V/CTLA-4−/− mice are resistant to infection with L. major. A, BALB/c, C57BL/6, FL/CTLA-4−/−, ΔCTLA-4 tail/CTLA-4−/−, and Y201V/CTLA-4−/− mice were infected in each hind footpad with L. major as described in Materials and Methods. Disease progression was determined by measuring footpad thickness with a metric caliper. The results shown are the mean footpad measurements of groups of two animals each and are representative of eight animals from two independent experiments. B, Susceptibility to L. major infection correlates with increased production of IL-4. Draining popliteal lymph node cells from infected animals were collected and cultured with soluble parasite Ag in vitro. After 48 h, supernatants were analyzed by ELISA for IFN-γ (□) and IL-4 (▪) levels. The results shown are the mean of triplicate wells from individual mice and are representative of five mice from two independent experiments. Draining lymph node cells from infected animals were restimulated in vitro with soluble Leishmania Ag and cytokine profiles were determined (Fig. 8⇑B). Resistant animals, including FL/CTLA-4−/− and Y201V/CTLA-4−/− mice, produced undetectable levels of IL-4 and produced high amounts of IFN-γ. In contrast, susceptible mice, including ΔCTLA-4 tail/CTLA-4−/− mice, produced high levels of IL-4. Addition of an anti-MHC class II Ab resulted in undetectable levels of cytokines in all cultures, demonstrating that class II-restricted helper T cells were mediating these effects (data not shown). These data confirmed that increased susceptibility of ΔCTLA-4 tail/CTLA-4−/− mice to L. major infection correlates with increased production of IL-4. CTLA-4−/− mice have proven to be a valuable system for elucidating the in vivo functions and interactions of molecules involved in the CD28/CTLA-4:B7-1/B7-2 pathway. To identify critical regions involved in the regulation of the immune inhibitory function of CTLA-4, we have introduced various CTLA-4 transgenes into mice deficient for endogenous CTLA-4. A wild-type form of CTLA-4 introduced into CTLA-4−/− mice rescues the null phenotype. A mutated form of CTLA-4 lacking the cytoplasmic domain is able to provide for a partial rescue. Mice that lack the CTLA-4 cytoplasmic domain are long-lived but show progressive lymphadenopathy and accumulate activated T cells with age. Lymphocytic infiltration and tissue destruction are absent in this line, providing an explanation of why these animals do not succumb to an early death. These results demonstrate that the presence of the extracellular and transmembrane portions of CTLA-4 is able to provide an inhibitory effect sufficient to control autoimmunity but insufficient to control homeostasis. This effect appears to require a critical level of cell surface expression since a second founder that expressed lower levels of the ΔCTLA-4 tail transgene still developed autoimmunity but with delayed onset. However, even when the mutant receptor lacking the CTLA-4 cytoplasmic domain is expressed at levels comparable to endogenous CTLA-4 on wild-type cells, the rescue of the CTLA-4−/− phenotype is incomplete. These data suggest that CTLA-4 ligand binding alone is not sufficient to account for the ability of CTLA-4 to suppress ongoing T cell activation and accumulation. The highest levels of constitutive and inducible CTLA-4 expression were observed with the CTLA-4 Y201V animals. These animals also displayed a complete rescue of the CTLA-4−/− phenotype, suggesting that Y201 may not be absolutely required for CTLA-4 function. However, since mutation of Y201 results in greatly increased levels of CTLA-4 on the cell surface, it is possible that this increase in CTLA-4 surface expression can compensate for any defect due to a lack of Y201. CTLA-4 has been proposed to suppress the activation of resting cells, therefore inducing anergy or increasing the threshold of T cell activation. Both FL CTLA-4 and Y201V CTLA-4 are expressed in freshly isolated cells at levels that are reproducibly higher than wild-type cells; nevertheless, these animals are able to mount a curative immune response to leishmaniasis. Thus, constitutive CTLA-4 expression does not prevent activation of naive T cells to pathogens even when expressed at supraphysiological levels. We have found that the CTLA-4 cytoplasmic domain plays an important role in the regulation of T cell activation and Th cell differentiation. Although an initial characterization of the CTLA-4−/− mice did not find a skewing toward either a Th1 or Th2 phenotype (20), recent in vitro studies have suggested that a lack of CTLA-4 function may predispose activated T cells toward Th2 development (47, 48). The studies presented here provide an in vivo demonstration of the critical role of CTLA-4 in regulating the Th1/Th2 balance and show that the Th2 skewing in these mice is physiologically relevant. Furthermore, our data suggest that this skewing alone is insufficient to result in autoimmune organ dysfunction and that additional mechanisms must exist for manifestation of the full CTLA-4-deficient phenotype. The molecular basis for the regulation of Th differentiation by CTLA-4 is not known, but may be due to the induction of specific transcription factors that regulate Th cell development upon CTLA-4 activation (49) and/or an effect of CTLA-4 on cell cycle progression and cell division (50). In summary, these studies suggest that the inhibitory effect of CTLA-4 is mediated in part by competition for B7 ligands but that the cytoplasm domain of CTLA-4 is required for full inhibitory function. These data also provide in vivo evidence that CTLA-4 plays a role in regulating the Th1/Th2 balance. The ΔCTLA-4 tail/CTLA-4−/− animals displayed evidence of a progressive systemic involvement of Th2 cells and responded to in vivo challenge with a Th2-biased response. Since this phenotype is corrected by the FL and Y201V transgenes, the data suggest that the CTLA-4 cytoplasmic domain is contributing to the regulation of Th1/Th2 balance. This could occur through its ability to initiate signal transduction or as a result of its ability to localize CTLA-4 to specific sites during T cell activation. These data support that residues in addition to Tyr201 play a critical role in regulating the activity of CTLA-4. We thank Mandel Davis for technical assistance and Drs. R. Arch and M.-L. Alegre for helpful discussions and critiques of this manuscript. ↵1 This work was supported by National Institutes of Health Grants P01 DK49799 (to C.B.T. ), AI 42370 (to S.L.R. ), and K08 CA78591 (to E.C.). ↵2 E.L.M. and E.C. contributed equally to this work. ↵5 Abbreviations used in this paper: CyC, Cy-Chrome; KLH, keyhole limpet hemocyanin.